The Spring season is really not that far off. Can’t you just smell the flowering trees and freshly turned garden soil? To your dog, the arrival of Spring smells is like a kaleidoscope of odor. 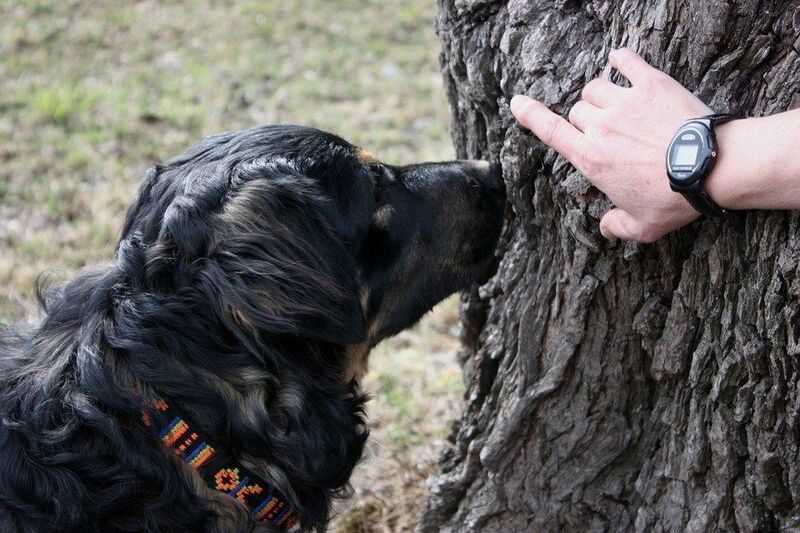 Where we recognize a dozen scents, your dog notices hundreds of them. His sense of smell is so acute, that with dog scent training, a dog can find almost anything. 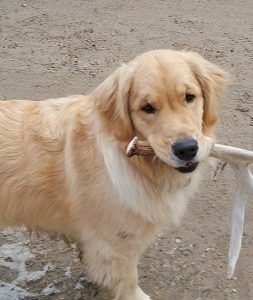 Here are a few fun and useful skills to make scent training both interesting and rewarding for you and your dog. The creation of a scent box is not so much about acquiring a new skill, but rather a way you can enhance the reward of an already smelly earth. When vegetation is disrupted it releases odors into the air. This principle is used by police tracking dogs, who target on not only the scent of the perpetrator but also the smell of freshly disturbed ground where the person has passed. For this project, you will simply rough up a track of ground for your dog to sniff. A rototiller makes a great scent box, but your dog will be perfectly happy with one created with a lawn rake. For added fun and to help less nose-driven dogs, you can bury dog biscuits in your scent box. Always make your dog work for their reward. Only allow your pup to enter the scent box by permission. Here’s how to create this prop. Fill a quart Ziploc bag with mixed vegetation from the park. Simmer the “vegetable stew” on low heat for an hour, and then let cool overnight. Strain the “stew” through cheesecloth into a clean spray bottle. You now have ‘Outside-In-A-Bottle.’ On occasion, you can lightly spray areas of your house and the dog’s toys. This also can provide enrichment for older dogs that spend a good amount of time in bed. Infusing the bedding with the odor can bring back memories of an adventurous youth! Our last Dog Scent Training project has the potential to be both productive and profitable. We will harness and focus your dog’s amazing ability to discriminate a single scent out of hundreds. Here are a few possible applications. Find a certain tree species for wood carvers. Basswood is a good example. Find rare wild edibles like Wild Ginseng. Locate the grubs in your garden so you can remove them before they do damage. The applications are endless; luckily the base dog scent training technique is nearly the same for all. Here is a brief overview of the training steps. You’ll want to consult a dog trainer in order to really help your dog excel at using his nose. Decide how you want your dog to alert you when he finds the scent (AA- Alert Action). Sitting, laying down, barking, etc. Associate the alert with the specific scent (SC). Present the SC and ask the dog for the AA. Reward once accomplished. When your dog is presenting the AA immediately upon smelling the SC and without your verbal command, you can move onto the next step. With three small boxes, place the SC in one and leave the other two boxes empty. Tell your dog to “find it” and lead him to each of the boxes. When your dog reaches the box with the SC, he should present the AA. If not, you may give the AA command. Eliminate the need for the verbal command as quickly as possible. When your dog is successfully locating the correct box and presenting the AA without command, move your SC outdoors and repeat the previous step. Gradually increase the hiding distance of the SC. Be cautious not to move from one step to the next too quickly. For some dogs, this process can take months. College for Pets offers dog enrichment classes that help focus your dog’s energies into constructive behavior. Dog scent training is one of those activities. Sign up for a dog scent training session and we can show you how to begin training your dog to fully utilize its amazing nose.